June 2013 Archives - Newman Dignan & Sheerar, Inc. - Providence Fee-Based Financial Advisors June 2013 Archives - Newman Dignan & Sheerar, Inc. Negative pressure continued for global markets last week following the recent hawkish tone coming out of the U.S. Federal Reserve. Equities, fixed income and commodities sold off for the week with the Dow Jones down 1.8%, the U.S. 10 year treasury rising to 2.54% (its highest levels since 2011), and Gold down 6.9%. The S&P 500 is still up 12.8% for the year but we have given back over 4% in the past 4 weeks. Markets gyrated quite a bit last week as increased uncertainty about the economy and the direction of the Federal Reserve unnerved investors. For the week, the Dow Jones Industrial Average finished at 15,070.2 to close down by 1.2%. The S&P 500 closed at 1,626.7 for a decline of 1.0% for the week. The Nasdaq Composite closed the week at 3,423.6 for a decline of 1.3%. Most international markets fared similarly as the EAFE (Europe, Australia and Far East) Index gave back 1.1% for the week. Bonds were relatively unchanged for the week with the benchmark 10-yr treasury closing the week with a yield of 2.12% (from 2.14% the previous week). Economic news last week was largely mixed. U.S retail sales and initial jobless claims were better-than- expected, yet manufacturing and industrial production news were less-than-expected. The World Bank (who?) lowered global growth expectations to 2.2% in 2013 and 3% in 2014, yet they see smoother growth ahead (wouldn’t that be nice?). Investors will be keeping close tabs on comments from this week’s Federal Open Market Committee meeting scheduled for Tuesday and Wednesday. Other notable items this week include the consumer price index, producer price index and Home Builders survey. We expect more volatility this week as Fed comments and economic news will likely fail to provide clarity to investors. We urge investors not to get caught up in the day-to-day noise of the markets. Instead, focus on long-term goals and enjoy the nice weather! The Market ended the week with respectable ~0.8% gains, albeit with a lot of volatility. Monday’s positive cancer research developments were offset by Tuesday’s intra-day reversal. The Dow broke its string of 20 consecutive positive Tuesdays. Midweek dollar weakness coupled with abrupt strength in the yen further roiled equities, but Friday’s payroll numbers boosted the S&P 500 by 1.3% for the day. Quantitative Easing by the US, the European Union and more recently Japan has been a big boost for both the bond and stock markets. However, it appears that its usefulness is coming to an end [some would argue that unlimited money printing was never a net positive]. Mentions of QE’s inevitable end have been one of the primary reasons for recent market downdrafts, and it is becoming clearer that the transition back to sound money policies will cause further bond and equity angst. Finally, it should be noted that the federal budget deficit has improved dramatically. The Sequester and [perhaps only temporary] slower Medicare spending growth has reduced the obscene $1 trillion-plus annual deficit to “only” ~$640B for this year. An annual deficit of four percent of GDP is still too large, but it is a step in the right direction. Last week equity markets finished lower with the S&P 500 down 1.1%. 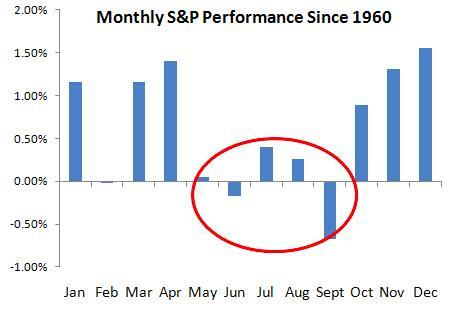 However, the S&P 500 was up 2.1% for the month and 14.3% year-to-date. Bonds, most notably long duration U.S. treasuries, have been under pressure as interest rates have moved up from their historic lows. The Barclays US Aggregate Bond was -0.69% for the week, -1.78% for the month and -0.91% year-to-date. The recent market pressure is related to uncertainty around the Fed’s expected tapering of quantitative easing. Investors are now focusing a sharp eye on economic reports that may dictate future Fed moves. 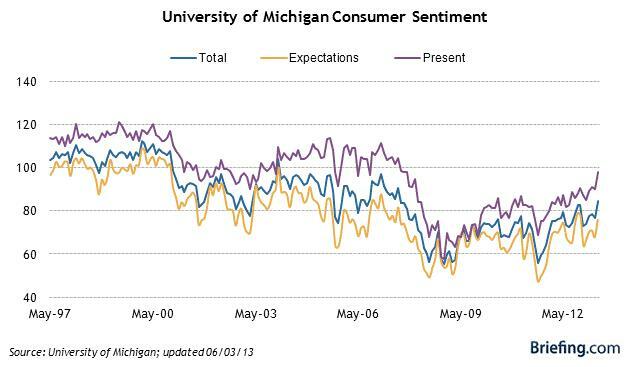 For example, on Friday consumer sentiment (shown below) and Chicago PMI were stronger than expected. Stocks retreated on the day because investors viewed these reports as signs the Fed could taper sooner rather than later. Regardless, this may be the start to a much discussed equity market correction. As we have stated recently, market corrections will most likely be sallow.